Gorilla Monsoon and Bobby “The Brain” Heenan are on commentary. Kato and Tanaka are accompanied by Mr. Fuji. Jim “The Anvil” Neidhart and “The Rocket” Owen Hart are accompanied by their awesome puffy pants. Hart and Kato start the match with some chain wrestling. Monsoon announces that due to injuries, Marty Jannetty and Nasty Boy Brian Knobbs are being replaced by Nikolai Volkoff and Haku in the Royal Rumble match tonight. Hart takes control and tags Neidhart, who throws Kato around. Tanaka, appearing to be in horrible shape (wearing a t-shirt) tags in. Monsoon tells the story of how Bret Hart lost the Intercontinental Title two days ago but was so sick that The Mountie was able to defeat him and capture the gold. Meanwhile, Bret’s Brother Owen, who is wrestling in the match currently going on, has taken control of Tanaka. Owen and Anvil work together to keep Kato and Tanaka down. Finally, the Express gains control with a little help from Fuji. Owen makes several come-back attempts but continually gets shut down. Of course, the comeback eventually does happen, and Anvil cleans house. Kato gets dumped to the floor and Owen wipes him out with an impressive dive. Anvil slams Tanaka and then they hit the Rocket Launcher to get the win at 17:19. That was too long for what they had to say, but it was a solid opener otherwise, just not up to the level of what Kato and Tanaka pulled off last year. Mountie has been the champion since 1.17.92, and this is his first defense. He’s accompanied by Jimmy Hart. The match was supposed to be Bret Hart defending the title against Mountie, but Bret must have been injured or something (I don’t recall), so he dropped the belt to Mountie at a house show and Piper is stepping in to take his place here as the challenger. Piper goes right after Mountie before the bell. Hart interferes on the floor to give Mountie a brief advantage before Piper fights back with his most prolific offensive weapon – the punch. Piper hits a bulldog, but it only gets two. Mountie cuts him off and takes over with his boring stuff. Piper fights back with a sunset flip for two. He hits even more punches and a back-body drop. Piper thinks he throws Mountie to the floor, but Mountie skins the cat, only to accidentally knock Hart off the apron. Then Piper locks on the Sleeper and Mountie is out at 5:22! That is Piper’s one and only singles title in his WWE run, and it led to the best match of his career. At least good things happened because of this match; because on its own it was not good. Piper is the first man to wrestle twice at the Rumble, and the first man to ever get a shot at both the Intercontinental and WWE Championships in the same night. The Beverly Bros are accompanied by the Genius, who recites a poem before the match. The Bushwhackers are accompanied by Jameson, who does nothing. They stall forever to start, as it takes almost three minutes before any contact is made. Beau and Blake take the first control but are soon thwarted by Butch and Luke’s unorthodox offense. Back in the ring they all stall some more. Once again, the Bushwhackers come back with their usual stuff and the Brothers bail again. The Bushwhackers outsmart the Brothers continually, which is just absurd. Finally, the Brothers take control on Luke, keeping him in their half of the ring. Outside the ring, Genius bullies Jameson, slapping him across the face. That leads to nothing. After what seems like an eternity Luke hits Beau with a clothesline and makes the hot tag. Butch is a house afire. The referee loses control and I’m losing patience. Beau hits Butch with a double axe handle off the top rope and Blake gets the pin at 14:57. That was simply rotten. After the match, the Bushwhackers and Jameson get their heat back by abusing the Genius and licking each other. Is anyone else disturbed by Luke and Butch licking young kids at ringside? That’s all kinds of disgusting. Earthquake and Typhoon are accompanied by Jimmy Hart. Hawk and Animal have been the champions since 8.26.91. Typhoon and Hawk start the match. They try to out-power each other, and Hawk wins that battle with a clothesline off the top rope. Earthquake tags in and he tries a dropkick, but it misses. Animal tags in and they size each other up. Johnny Ace’s brother tries a bodyslam, but Earthquake falls on top. Typhoon tags in and Animal comes right back. It’s sad that Hawk and Animal barely even sell for guys like Earthquake and Typhoon. Hawk tags back in and now the Disasters take control for real; Hawk even sells for them, so I take back what I said earlier. Of course, Hawk comes back and makes the hot tag and the referee loses control. All four men spill to the floor to continue brawling. The referee starts the count and Typhoon barely sneaks back in the ring to get the countout win at 9:23. That was dull, and the finish was puzzling, given that the makeshift team of Ted DiBiase & IRS won the titles from the LOD a few weeks after this anyway. 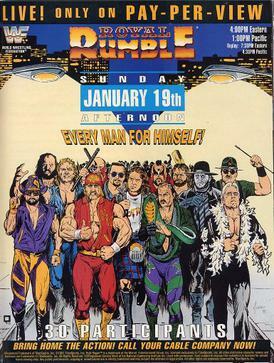 The title has been vacant since 12.7.91, after two controversial matches between Hulk Hogan and Undertaker. As a result, Hogan and Undertaker both got to pick numbers between 20 and 30. I love little touches like that. British Bulldog (who recently won a 20-man battle royal in England) draws #1 and “Million Dollar Man” Ted DiBiase with Sensational Sherri picked #2. They start off hot, both going for a quick elimination. That goes well for Bulldog, who dumps DiBiase to the floor. That was certainly quick. Ric Flair comes out at #3! That’s huge. Bulldog goes right after Flair, and when Jerry Sags with Jimmy Hart comes out at #4, he helps Flair. Even so, Bulldog is able to come back and eliminate Sags. Next up is Haku at #5. Bulldog also eliminates Haku as #6 Shawn Michaels makes his way out. Tito Santana is #7. The action continues at a fast pace given the talent of all four men in the ring. Barbarian comes out at #8. Kerry Von Erich is #9, raising the death toll in this Rumble to two. Repo Man brings us to the one-third mark at #10. Greg “The Hammer” Valentine is #11. Flair is everyone’s target, which makes Heenan crazy on commentary. Nikolai Volkoff comes out in the #12 spot. He’s a babyface but draws mostly boos from the sounds of it. In one corner of the ring Valentine locks Flair in the Figure-Four Leglock and Barbarian breaks it up. Repo Man dumps Volkoff for another quick exit. Big Boss Man is #13, raising the death roll to three. Repo Man tosses Valentine. Who would have thought Repo Man would eliminate anyone in the Rumble, let alone two guys? Just as I type that, Boss Man hurls Repo to the floor. Flair eliminates Bulldog after an impressive 25-plus minute performance, and then dumps Von Erich out as well. Hercules is #14 and that bumps the death toll to four (seven if you count the undercard). Hercules dumps Barbarian, Boss Man dumps Hercules, and Flair dumps Boss Man to be all alone in the ring! That’s awesome. New Intercontinental Champion “Rowdy” Roddy Piper is #15 and that’s just great booking right there. Piper’s reaction to having Flair all to himself is priceless. Flair runs to the floor (but not over the top rope) and Piper follows him to continue the assault. Piper utilizes the airplane spin and the Sleeper. Flair is in trouble here. Jake “The Snake” Roberts is #16. He even goes after Flair. “Hacksaw” Jim Duggan comes out at #17 to a monster pop. Irwin R. Schyster is #18. Not much happens until Jimmy “Superfly” Snuka makes his way out at #19. Rounding out the first two-thirds is Undertaker with Paul Bearer at #20. Undertaker immediately tosses Snuka. “Macho Man” Randy Savage is #21 and he is laser focused on finding Roberts. He gets his hands on his hated rival and eliminates him. Savage then stupidly goes over the top rope to continue beating Roberts up. He should be eliminated by the rules – even Monsoon says so – but the referee rules that you must be thrown over the top rope by another competitor. Okay then. Berzerker is #22, and Virgil is #23. Col. Mustafa with Gen. Adnan comes out at #24, and he’s technically a former WWE Champion since he used to be the Iron Sheik. Rick Martel, who set the longevity record last year, is #25. Hulk Hogan makes his way out at #26. He goes right after Undertaker and Flair, sending Undertaker to the floor with a clothesline. Berzerker is the next one to go and then the shirt gets ripped. Duggan and Virgil eliminate each other. Skinner is #27. Former WWE Champion Sgt. Slaughter is #28. Martel eliminates Skinner, and moments later Flair sets the record for longevity, crossing the 53-minute mark. Sid Justice is #29. Hogan and Flair fight on the floor as Warlord with Harvey Wippleman is #30. Sid eliminates Slaughter. Piper eliminates Schyster via his tie. Hogan and Sid eliminate Warlord. Sid then pushes Piper and Martel to the floor at the same time. We’re down to the final four – Sid, Savage, Hogan, and Flair. Sid eliminates Savage, and then watches Hogan beat on Flair. He then sneaks up from behind and eliminates Hogan completely fairly. Hogan then grabs Sid’s arm and helps Flair eliminate him, and Ric Flair wins the Rumble at 61:59! The lineup in this Rumble was amazing, and the booking was perfect all the way through. That was a great performance from Flair, and this is still the best Rumble match of all-time. The Rumble Match is one of if not the very best one ever, so that alone makes this a show worth watching. The opening tag is decent, and seeing Piper win the Intercontinental Title is fun.